Nov 14/0810 Nov 14/1240 310 NA Nov 14/0518 C1/BSL N28W90 8375? Jan 23/1105 Jan 23/1135 14 NA Jan 20/2005 M5 N27E90 ? The >10 MeV proton event began on January 16 at 0210 UTC following the X2.6 flare late on the 15th. The peak flux following this flare was 365 pfu at 16/1840 UTC. The >10 MeV protons decayed to 117 pfu by midday on January 17 when a stronger injection of protons occurred following the X3.8 flare and CME. This new infusion began at 17/1240 UTC and peaked with 5040 pfu at 17/1750 UTC. The event decayed to about 19 pfu early on January 20 when yet another proton flare occurred. The X7 flare and CME that occurred on January 20 produced the hardest and most energetic proton event of Cycle 23. The >10 MeV protons peaked at 1860 pfu at 20/0810 UTC. The >100 MeV protons peaked at 652 pfu at 20/0710 UTC, which was the highest >100 MeV proton flux level observed since 1989 October (680 pfu). The >10 MeV proton event finally ended at 22/1755 UTC. 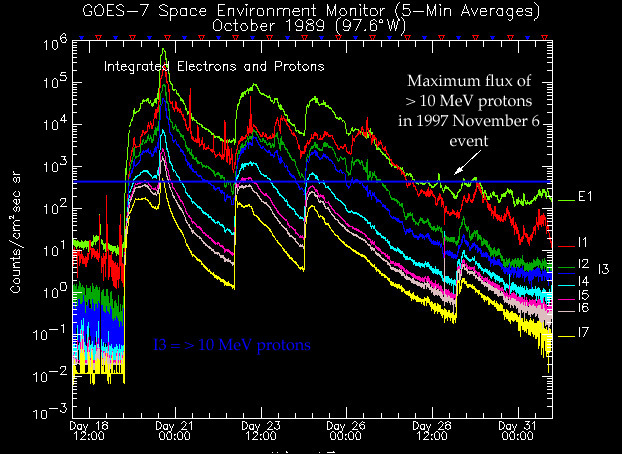 Compare the amazing proton events of 1989 October with the proton storm of 1997 November. Please Note: Proton fluxes are integral 5-minute averages for energies >10 MeV, given in Particle Flux Units (pfu), measured by GOES spacecraft at Geosynchronous orbit: 1 pfu = 1 p cm-2 sr-1 s-1. SESC defines the start of a proton event to be the first of 3 consecutive data points with fluxes greater than or equal to 10 pfu. The end of an event is the last time the flux was greater than or equal to 10 pfu. This definition, motivated by SESC customer needs, allows multiple proton flares and/or interplanetary shock proton increases to occur within one SESC proton event. Additional data may be necessary to more completely resolve any individual proton event. Different detectors, onboard different GOES spacecraft, have taken the data since 1976. These proton data were processed using various algorithms. To date, no attempt has been made to cross-normalize the resulting proton fluxes. Flare associations are given, although data about individual coronal mass ejections (CMEs), available from SOHO only since 1996, are necessary fully to characterize each event. CME information for earlier events from the SOLWIND and SMM coronagraphs will be added in the future. For more information on SEP events, contact Bob Rutledge of the NOAA Spa e weather Prediction Center.